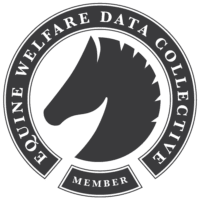 WASHINGTON, DC – The Equine Welfare Data Collective (EWDC), a collaborative effort to accumulate, analyze, and report data to enhance programming for transitioning and at-risk equines, has begun the collection of metrics within the equine welfare industry. The Collective was created by the United Horse Coalition (UHC), a program of the American Horse Council (AHC), with funding partners being The Right Horse (TRH), The American Society for the Prevention of Cruelty to Animals (ASPCA), and the American Association of Equine Practitioners Foundation (AAEPF). Participation in the EWDC is free, and all data collected will be aggregated so no individual organization is identified. Organizations that contribute data will be the first to receive the results and will be given an EWDC badge for their website to publicly demonstrate their commitment to the mission. Granting organizations such as the UHC, WAF, AAEPF, and the ASPCA will be looking for an organization’s contribution to the EWDC as part of their funding considerations.